“No more camp,” Emma said, sitting near my face on the bed. It was sometime between 5:30 and 6:00 AM — my morning wake-up call. “Camp all gone. Get on the plane, go see grandma,” she added hopefully. “No Emma. One more week of camp, then we get on the plane and go to the hospital, meet mommy, then go to grandma’s house,” I corrected her. I’m guessing she really misses mommy and Nic from her first-thing-in-the-morning declaration that camp needed to be over right now, and it was time to get on a plane. I’m flying solo with Emma this week. Actually Joe is my copilot, working the day shift, taking her to camp until we fly to Panama Sunday and meet up with Ariane. We spent the morning après pancakes getting ready for our Central Park outing. I’d offered to take her to Coney Island but she surprisingly passed, opting for Victoria Gardens instead. We rode the rides, had lunch and then Emma wanted to “go to the sprinklers” – which meant a nearby playground with a water spray. On the way over we passed by the carousel, which was closed for repairs. She took it well, no crying, no screaming, no meltdown – she seemed to ‘get it’ that it was closed and that was that. I thought of all the times I’d been in the park with her and she had one of those spectacular tantrums because she wanted to do something and I said no, because we had to do something else or go home. She was so well behaved this time, and we had such an easy day in the park thus far that I wondered if maybe those tantrums were a thing of the past now – that she had mastered another level of growth and maturity — that she had learned how to cope with frustration and disappointment without going haywire. We went to the playground. She splashed and romped for quite a long while then said she wanted to go home. As we left she started walking north toward 72nd street. “No Emma, we’re going this way,” I said, pointing downtown. “Emma, the orange train doesn’t run on weekends, we have to take the red train,” I said, trying to sound as reasonable as I could, but already feeling a tsunami of dread cresting above my head. That was always one of my favorite Kurt Vonnegut lines. Such a perfect synopsis of life’s ceaseless challenges, fleeting success and predictable disappointment. She kept screaming for the next half hour while I weathered, for what seemed like the millionth time, the looks of panic, concern, confusion, irritation and scowling judgment, or more accurately, indictment. Why was this pretty little girl screaming like that? What is that awful man doing to her? Who is he? Why isn’t he comforting her? Is she crazy? Some kind of spoiled brat? And on and on and on. I could have ended it all instantly by simply doing what she wanted, walking where she wanted to walk, doing what she wanted to do, whether there was an orange train running or not. It sure would have made both our lives easier, not to mention the lives of all the traumatized onlookers. And then what? Emma is a smart little girl who wants what she wants, like any other kid. But if I rewarded her tantrum with the gift of doing exactly what she wanted when she wanted it, the only lesson that would be learned was that screaming works, and the louder you scream, the more you cry, the better it works. I could have taken the path of least resistance, and believe me, I would have definitely preferred to — if my comfort were the only thing that mattered. But my comfort was as expendable as my desire to look virtuous or shield myself from embarrassment. I had to do the right thing for her and for me, regardless of the incriminating glares and withering head shakes. I went to the nearest bench and sat down. Eventually Emma followed and sat next to me, still crying and screaming. I asked her if she wanted to take a taxi or the red train. More screams and crying. I explained over and over that the orange train wasn’t running and it made me wonder whether she is capable of understanding something even that simple. Ultimately she calmed down and said, “Take a taxi?” Part question, part capitulation. These photos are from last year, but until I can get some photos from this year, they will have to do. Emma leaping with abandon into the lake. Emma loves this game and we have even played it at home seated on the floor of the living room. Emma with one of two little girls who befriended her and made sure she was included. Emma woke this morning, saw the grey sky and said, “Uh-oh! No swimming!” As swimming is her favorite activity I think she was worried they would not have enough to do. Joe reassured her as they left to get on the bus that there would be plenty of other activities, including gymnastics, her second favorite thing to do! We discussed her autism and agreed Joe would need to shadow her and facilitate interactions with the other children if it was going to work. The owner was amenable to everything and willing to take a chance. The camp also had a strong anti-bullying policy, which appealed to us and so after further discussion we signed her up, agreeing that she should take the bus with the other neuro-typical children. Last summer turned out to be a huge success. The other girls in Emma’s unit were kind and inclusive. Two little girls even took a special interest in helping Emma out with things she didn’t seem to understand and held her hand as they went from one activity to another. Joe reported to us each afternoon as did the camp manager. I am, to this day, incredibly grateful to those two little girls in particular who took it upon themselves to help Emma and include her in the group. Children can so often be cruel to one another particularly if one child is “different” so it was particularly heart-warming to hear of children being so generous and kind. As a result we signed both Nic and Emma up again for this summer. Emma began asking about camp in April. “It’s too cold,” Emma said. “Not yet, Em. In another month and a half,” I said. “It’s too cold,” she said. “It’s closed. Daddy has to fix it,” Emma said. “No. You have to wait. After we get back from Colorado,” I said. “You have to wait,” Emma repeated. “Not for another two weeks Em,” I said. To which she revised her script, “Sleep wake up sleep wake up sleep wake up sleep wake up sleep wake up sleep wakeup sleep wake up sleep wake up sleep wake up,” she said as she counted out on her fingers how many sleep wake ups there were before the blessed day. When there were too many or if she forgot where she was in her counting she began to laugh and said very quickly, “Sleepwakeupsleepwakeupsleepwakeupsleepwakeupsleepwakeupsleepwakeup…” until I would stop her. “Em I can’t keep up!” I said. “Pancakes?” Emma said with a sly grin. As if by squeezing in “pancakes” among all the “sleepwakeupsleepwakeups” she thought I might not notice and actually make them with her. “Noooooooo! We cannot make pancakes! We don’t have time,” She answered herself before I was able to say anything. Pancakes and camp became a running theme. Entangled in her mind – they are her two most anticipated activities other than going to see her Granma in Colorado. “Camp?” Emma said as she opened her eyes Monday morning. “Yes!” I said. “You’re going to camp with Nickey and Joe!” I said. “No not going to go on the school bus,” Emma said just to be sure she had the correct information. “Going on the bus with Joe and Nickey!” Emma shouted. “You’re going to camp, go swimming in the lake!” Emma said jumping up and down on the bed. “YES!” Emma said bouncing up and down. “Swam in the lake! Emma had so much fun!” Emma said. “YES!” Emma shouted. “Sleep wake up get on the bus with Nickey and Joe go swimming in the lake!” She said very quickly. “Sounds like an excellent plan,” I said. The parent of a severely disabled child asked me a few weeks ago what I wanted for Emma. She was referring to the long term, the far off future. “I’m assuming you’re not expecting her to go to Harvard,” she said. When Richard and I decided we wanted to try to have children we spent many hours discussing our views on parenting and childrearing. We were in agreement with almost everything. Neither one of us cared what college our child went to or even if they went to college. We both agreed we were more concerned with our children finding a career they loved. We agreed we wanted them to be kind, to be generous, to consider others and to behave in ways which foster that. We agreed we did not care what their sexual orientation turned out to be and we did not own them. We both felt strongly our children, if we were lucky enough to have any, were not an extension of ourselves, but independent beings. We agreed it was our duty to guide and advocate for them until they were old enough to advocate for themselves. It was the single best piece of advice anyone has ever given me. We as parents will make mistakes, we will use a harsher tone than we meant to or are even aware of, we will say things in anger we didn’t mean, we will model behavior that is not always exemplary, we will do things we wish we hadn’t. But we can say – I’m sorry. I made a mistake. And we can convey our love for our children as often as we are able to. When Richard and I first received Emma’s diagnosis we were given a barrage of information. 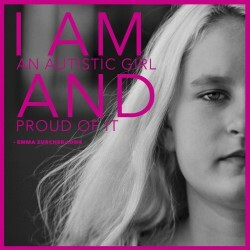 We were told to get Emma between 35-40 hours a week of ABA therapy. We trained with the ABA coordinator so we could continue using ABA with Emma after the therapists left. I remember thinking after the hundredth flashcard maybe I should just hold her. Emma wouldn’t let anyone else hold her, but if I sat in the rocking chair she would crawl into my lap. I would put my arms around her with her head resting on my chest and we would sit like that together for up to an hour sometimes more. During that early period it was the one thing I felt I could do with Emma, which no one else was able to do. It seemed more important than forcing her to do yet another puzzle or one more sequencing game. I reasoned, for a child who appeared emotionally cut off from other human beings, holding her was a kind of therapy too and perhaps as essential if not more essential than any of her other therapies. Those hours spent with Emma in my lap were bliss. Whether the physical affection made a difference or not I cannot know for sure. My guess is it did and continues to make a difference. To this day I remember as a little girl sitting between my mother’s legs by our swimming pool and leaning my small body against hers, her arms wrapped around me. There is something about physical touch, which promotes a state of well being unlike anything else. It is that state of well being I wish for both my children. Yesterday Richard, Emma, Nic and I went to a post wedding party for Joe, Emma’s therapist and Joe’s wife, Angelica. It is always interesting going to a function together as we never know how Emma will behave. Will she have a meltdown? Will she insist on leaving right away? Will she be so utterly unmanageable that we spend the entire party racing around after her? When it is a dressy affair, one with speeches and food, which she will have no interest in, it becomes all the more worrisome. We knew we had a better chance things would go well by the very fact that this was a party for Joe and Emma adores Joe. Still, we did our best to prepare her before we left. “We are going to get dressed up, then take a taxi and see Joe!” We told her. “See Joe!” Emma repeated, nodding her head and twirling in place. “That’s right Joe and Angelica,” I said. “It’s a birthday party,” Emma concluded. “No. It’s Joe and Angelica’s party celebrating their marriage,” I said, not sure how else to describe a post wedding brunch. “A wedding-birthday party,” Emma said. “Well, sort of. But it’s to celebrate their getting married,” I explained. “There’s going to be food there and lots of people…” I said. “And Joe and Angelica!” Emma interrupted me. “Angelica! Angelica!” Emma sang as she twirled in place. “And there will be a few speeches and we will see a video and then we will come home and change,” I continued. “Go to Chelsea gym bowling,” Emma said. “Yeah. Okay. We can go bowling at Chelsea Piers afterward,” I said. “Go with Mommy and Nickey and Daddy,” Emma said. “Okay! Emma put on a party dress,” Emma said. The party was lovely and Emma was terrific, on her best behavior. Joe’s niece was there, an adorable two-year old in a party dress similar to Emma’s. They ran around together, though in truth it was Victoria’s exuberant friendliness, undeterred by Emma’s less than attentive response to her, which kept their interactions going. If Emma sat down, Victoria sat down next to her. When Emma took her shoes off, off came Victoria’s shoes. When Emma ran around the room waving her arms, Victoria followed waving her arms as well. It reminded me of how neuro-typical children behave. They follow the older child and often mimic them. Emma never did that. People ate and chatted with one another. Both Nic and Emma ran around with the two other children there. Then Joe stood up to give his speech. Emma sat down and remained quiet as he spoke. It was a heart felt speech, incredibly moving and left many of us in tears. When it was my turn to give a speech, I pulled out my notes. I had decided, when considering what to say, that perhaps I would use at least some of my time explaining exactly what it is Joe does. I think it’s easy for people who know nothing about autism to assume he is a glorified babysitter. Someone who hangs out with Emma and takes her to the park. This could not be farther from the truth. When Richard and I went to Bethesda to train in the DIR/floortime method with Stanley Greenspan, who invented it and his son Jake, we were exhausted before the day had ended. Attempting to engage and evoke language from an essentially non-verbal child who is uninterested in any form of interaction is like nothing I have ever done. It is physically and emotionally exhausting. It requires a creativity, quick-thinking, concentration, focus and patience most people simply do not have. Richard and I have met hundreds of therapists over the years, some have it and many more who do not. The idea that anyone can effectively work with autistic children is just not true. Joe is the ninja master, the autism whisperer. He has a talent for it, an intuitive sense, which I have had the pleasure of observing many, many times. Joe is not just a gifted floortime therapist, he is also a well trained one. It is a formidable pairing. And yet, what I have witnessed time and time again is how Joe and others like him are undermined, their work is seen as little more than babysitting, their profession consistently undervalued. Devoting ones life to helping children with special needs is a noble calling. Joe is royalty among the noble. It was with these sentiments that I rose to give my speech. I cannot say I got through it flawlessly because I did not. I stumbled and I had to refer to my notes, I choked up several times and at one point had to stop speaking, as I was completely overwhelmed with emotion. But mostly I wanted others to understand the importance of what Joe does everyday. Joe has transformed Emma’s life in untold ways. His commitment to her, his dedication to her has formed who she is and who she will become. When I am with Emma during one of her legendary meltdowns I am fortunate if I have a momentary reprieve when I am able to ask myself – what would Joe say or do in this situation? The times when I am able to emulate Joe are the times I know I’ve done the right thing.